It’s done! and it really is wonderful! This is my first completed quilt, and I really couldn’t be happier. 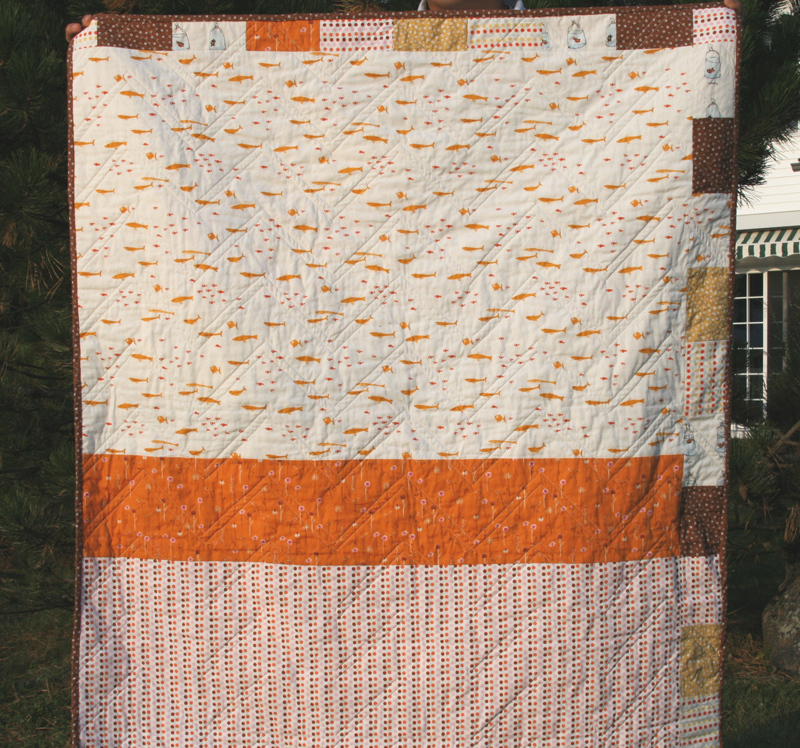 Since I still haven’t practiced any free motion quilting, I opted to quilt this one following the seams of the zig zags. I sewed a zig zag on either side of each seam and it created a nice look, especially on the back. Did I mention that I love how this one turned out? Will you call me crazy if I tell you I’ve been walking around the house with it? I don’t know what it is, but I really like looking at it. Hopefully it’s just that it’s my first quilt, and not that I’m a crazy person! In any case, despite this being baby quilt size, I’ve decided it’s big enough to cover most of me when I’m laying on the couch. Originally I thought it might be one I use as a gift, but now I think it’s destined to remain here with me. 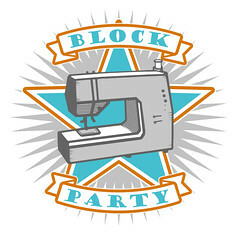 I can’t give away my first quilt, right? Thank you to everyone who encouraged me and provided helpful resources! 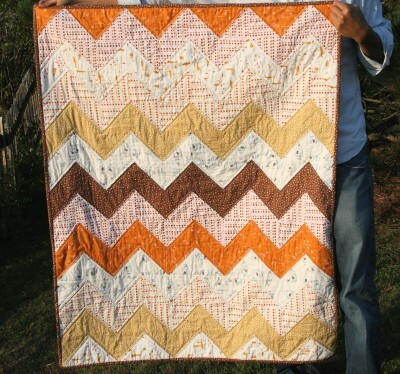 This entry was posted in [search] Zig Zag Quilts, 2008 Finished Quilts, Finished Quilts, Household Sewing - bags, napkins, pillows, Posts about Quilts, Quilts, Uncategorized and tagged baby quilt, Fabric, Heather Ross, modern, quilt, quilting, zig zag quilt. Bookmark the permalink. 27 Responses to I finished a quilt! I LOVE, LOVE, LOVE this!! Okay, I promise to have a baby now. It’ll be worth it, just to get my hands on one of these. Congratulations on your first completed quilt! That will be perfect as a lap quilt for movie watching and reading. Congrats! FYI, I gave away my second quilt, not my first. Just something about it. lol. Great job! You did it … and did it well! Congratulations on a finishing! It’s quite beautiful and a perfect fall keeper. I think I’ll have to come to your house for some inspiration to rub off on me. Yay!!! You did it! And it’s BEAUTIFUL!!! I really love it. I’d imagine that now you’re going to be eager to get all your other pretty quilt tops put together into quilts. 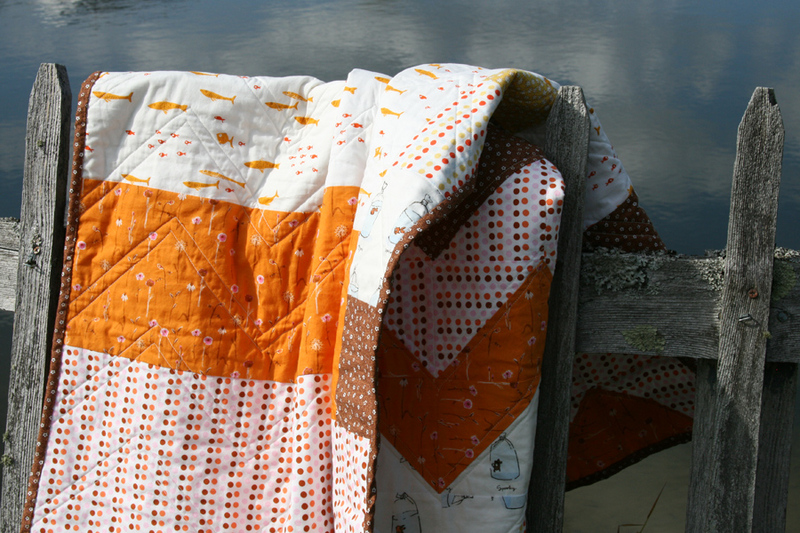 There’s nothing like pulling a new quilt out of the dryer after it’s first wash – all crinkly and warm. And I should add, there’s NOTHING crazy about carrying it around the house. 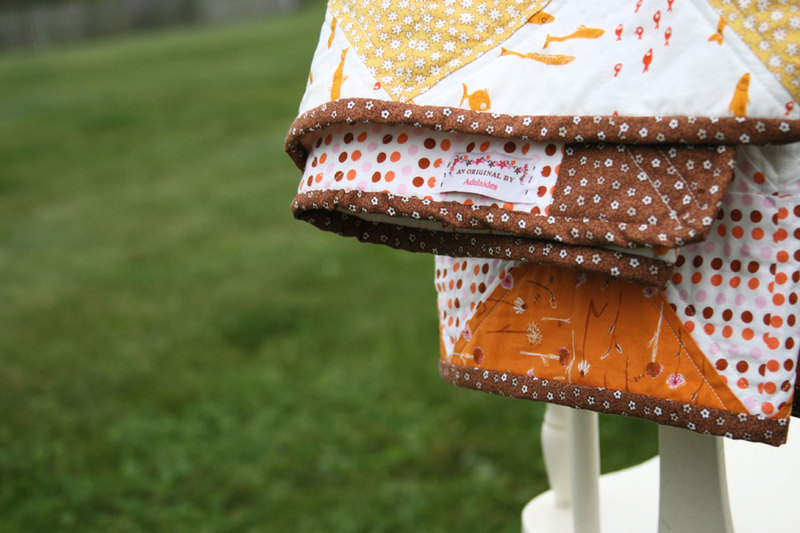 Sometimes a quilt needs full-time gazing. 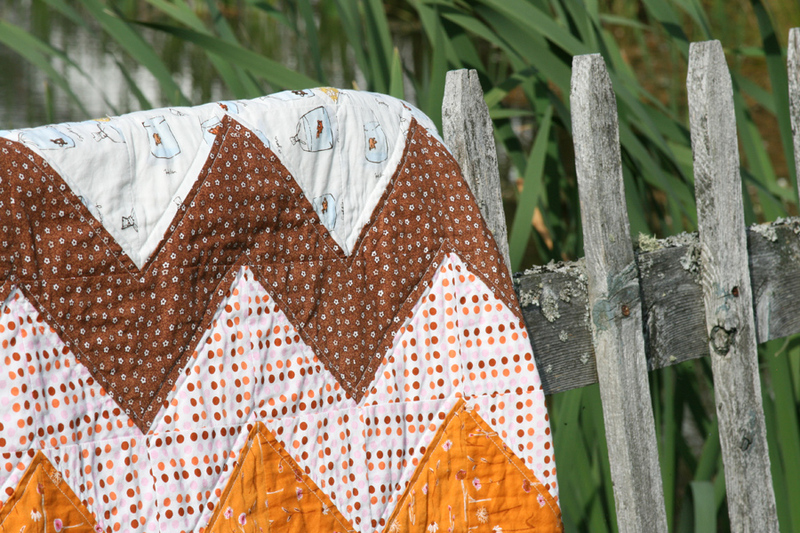 This quilt really IS wonderful! I love it so much, I want to make one exactly like it. Great job with the colors AND the quilting. Yippee! It is perfect!! Perfect fabric with the perfect pattern and the perfect size. Love it! Congrats! It is BEAUTIFUL! I love the fall colors. And the fence photography. Rockin’. Ditto from me too! 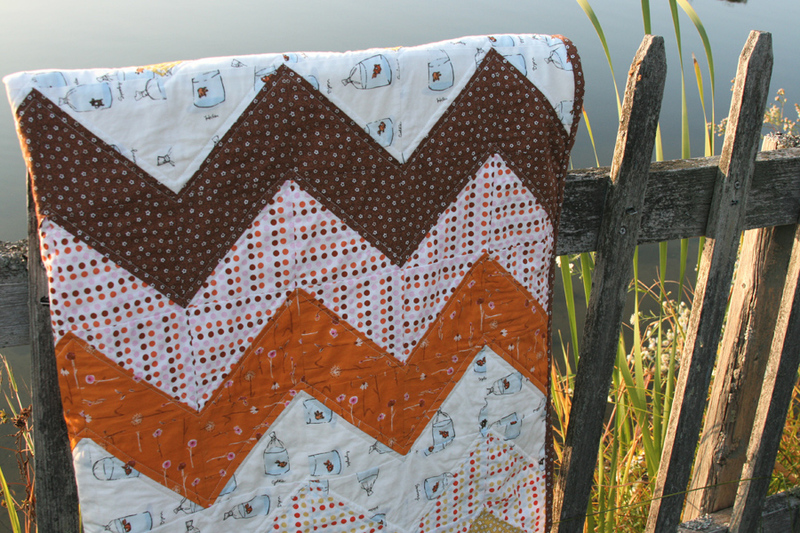 I love the way simple squares turn into triangle turn into zigzag – well done. 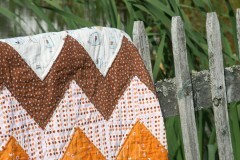 Found your blog because of this quilt! It is beautiful. You are on my reader now. Can’t wait to see the next creation. 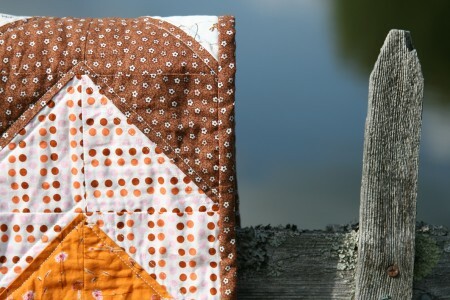 I LOVE the colors you used on this quilt! Congrats! I know just how gratifying that feels. I never want to put mine down either. The colors are just gorgeous with a very vintage feel. My favorite blanket growing up was crocheted, but in this same kind of zig zag pattern, so it makes me smile. I can totally understand walking around with it- it’s *gorgeous*! 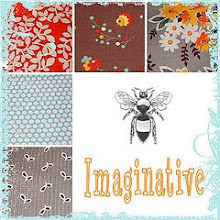 You’ve got a great sense for color- your fabrics are terrific. And I really like the crib/couch size for quilts- bed size ones are often too unwieldy for use on the couch. What a great quilt! Congrats! Love that fish fabric! I love the colors and pattern. It’s beautiful! 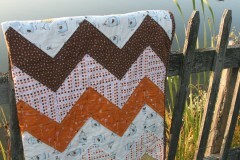 I’m interested in making a zig zag quilt myself… what size is your quilt and where did you get the pattern? Hard to believe that your first quilt was finished just over a year ago………you probably announced your anniversary, but I missed it. Anyhow, Happy Anniversary and congratulations on your proficiency you’ve developed in this one year ! 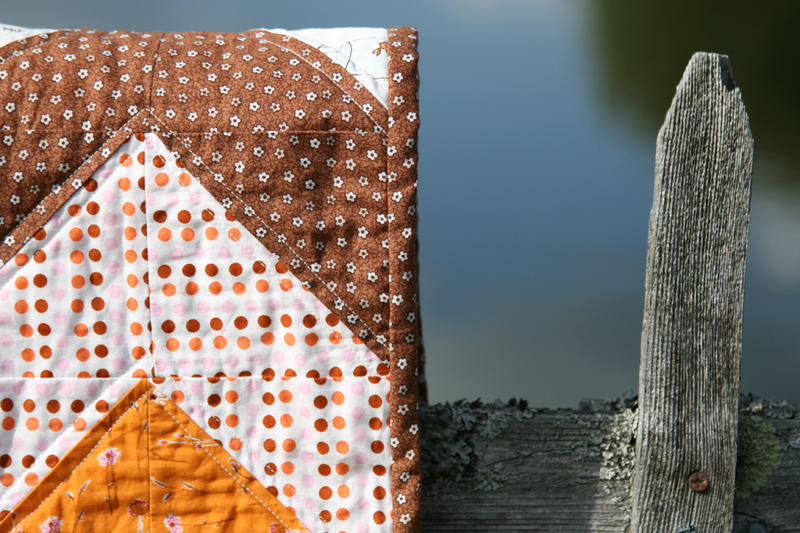 And thank you for sharing your journey, AND YOUR QUILTS.